We don’t see many Foden buses south of Birmingham, and we don’t see many Warrington buses down here either, so here is a view which fits both categories. OED 217 is a Foden PVD6 from 1956, when she was built for Warrington (still in Lancashire at that time!) Corporation. She has an East Lancs H58R body and is seen in the St Catherine’s Park & Ride site in Winchester, on 1 January, 2010, during one of those famous King Alfred Running Days. As I said, the day after this was photographed – having ridden on it – a beautiful bus; superbly restored and expertly driven. The vehicle looks superb, with very handsome bodywork. I saw another Warrington Foden PVD6 a couple of weeks ago, parked alongside track, at Onibury level crossing, on the A49, just south of Craven Arms, Salops. Impossible to stop or go back because it is a narrow, busy, road and parking appeared to be difficult. It appears to be fleet No. 102 (MED168) dating from 1954, with a Crossley body, not too dissimilar from the above one, from the brief glimpse I got (wife was driving). It was parked in the open air and looks a bit sad. I hope it won’t go the way of all metal. Incidentally, from a brief visit to Warrington some yeaasrs ago, I seem to recall the destination blind, "NOT IN SERVICE – SORRY! How polite! David Oldfield’s review of this same New Years Day out in Winchester appears in the "ARTICLES" section on this site! I can’t resist a digression here Chris H when you mention Onibury. Do you know Stokesay Court, a wonderful old mansion which lies in glorious grounds. It was taken over as a military hospital in WW1 and my Dad recuperated there from awful injuries on The Somme. The owners by the turn of the century were experiencing financial difficulty in maintaining the place, understandably, until a film company came looking for a stately home for an epic movie and Stokesay Court was chosen – so "Atonement" has to all intents and purposes saved the beautiful old place. Apologies, and now back to Warrington. I went to visit Stokesay, en passant, some months after seeing the slightly flawed ‘Atonement’, but it only took pre-booked tours. We walked around the impressive building and grounds, then moved on. Frustrating, Chris! A couple of weeks ago, we didn’t have time! "Sergeant Youhill, 15 West Yorks. Hoping this will help you and bring you happy memories of Stokesay Court Onibury Shropshire. Margaret Rotton." The book is one of my most treasured possessions. "15 West Yorks" was of course the "Leeds Pals" who were practically obliterated on the Somme. With renewed apologies to the good townsfolk of Warrington – now hold very tight please !! Looking at this photo brings it home to me just how much we have lost with the virtual demise of municipal transport. Here we have an operator that bought these vehicles from a small scale manufacturer (at least of buses) no doubt to support local industry with Sandbach being only a stones throw from Warrington. In addition we have a superb livery in what may be termed the ‘traditional’ style, unfettered by advertisements and route branding. We have a clear fleetname with the civic crest on the side panels and a clear and correctly set destination display. I know this is a posed photo in the preservation era but they were really like that in normal service. 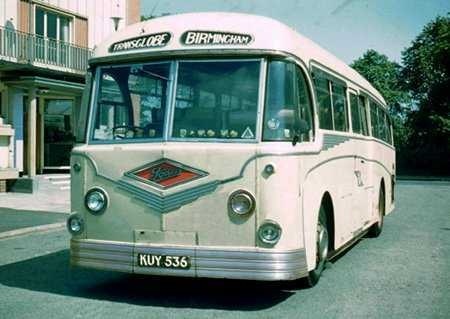 Warrington had other interesting buses as well with Bristol K6G’s and Leyland PD2 specials with longer but narrower 7’6" wide bodies. Ah nostalgia and civic pride! You definitely deserved red carpet treatment, Chris, and I’m glad it was afforded to you by some very kind folk. No such luck with a great uncle of mine, killed by a sniper on Oct 14th 1914, a couple of weeks after arrival! And now three rings on the bell! Philip, as you rightly say this unusual vehicle is quite simply magnificent – the combination of dignified civic pride and good taste with an out of the ordinary mix of chassis and body types. The Fodens were superb vehicles but, for the want of a better expression, needed driving properly. I’d only been driving about two or three weeks when I was asked to run an extra coach on the very popular Sunday evening trips from Otley – price 3/3d per ticket !! I eagerly agreed although I’d no idea at the time where Bishop Monkton was – it involved the treacherous ascent of Norwood Edge – and was allocated MUA 864 similar the 867 below. The late turn garage man, a very kindly experienced chap who was a mentor of mine in many ways quietly gasped "’E’s not give thi’ t’Fodden as ‘e??" When I quakingly replied that "he" had poor old Jackie went white and confided "Well, whativver tha’ does – for God’s sake pull up at bottom o’ Norwood Edge and gerrit i’ fust gear – cos if tha dunt and tha tries to change down tha’ll miss it un roll straight back inter t’ ressivoy." Bless dear old Jackie – a kindly saint in overalls. The other driver in the Tiger Cub made sure that I wasn’t left behind, and it was a grand trip which taught me an early lesson with the Fodens – just get the revs wrong by one rpm and the high pitched screeching could be heard for miles around !! Chris, I loved the story about your Sunday evening excursion up Norwood Edge, as I know it and Lindley Wood ‘ressivoy’ very well. I can vouch for the steepness of the hill, and the sharpness of its bend as you near the top. Hopefully the wonderful views from the summit took your passengers minds off the snail-paced climb in first gear to get there. Brendan – I doubt if the passengers even noticed the view after four or five miles of my woeful attempt to become a polished coach driver on such a "difficult for the unfamiliar" vehicle !! As many of them were no doubt used to seeing me issuing bus tickets as a conductor I fear that they may have been mentally checking their life assurance policies and hoping against hope for a final pint at Bishop Monkton. How I agree with your last point, Chris, the world looks a much better place hurtling to your doom AFTER having a pint or two! Lucky that a chance meeting enabled you all to live another day! I have to say I’ve never seen a single deck version of the PVD, only the rear-engined version. Rather nice looking. Chris H – there was good news for the reluctant mountaineers after their drinks as the return journey to Otley was by an equally picturesque but less exciting route. Here is a picture of the actual Foden, MUA 864, while waiting for a peak Summer express duplicate for West Yorkshire RCC – an enormous and highly lucrative contract for Samuel Ledgard. The coach is in the superb original "black roof" livery. This other picture shows ONW 2 – the two stroke 37 seater of 1951 which had appeared at the Commercial Motor Show as "FWP 1951." It was unchallenged in its heyday as the fastest PSV in the area, and for Winter comfort and ambience sported a two bar electric fire with cheery "coals." It is shown here in Chester Street, Bradford, also on a WYRCC express relief. Fodens south of Birmingham – some ran in South Wales – Caerphilly and West Mon both had single-deckers. 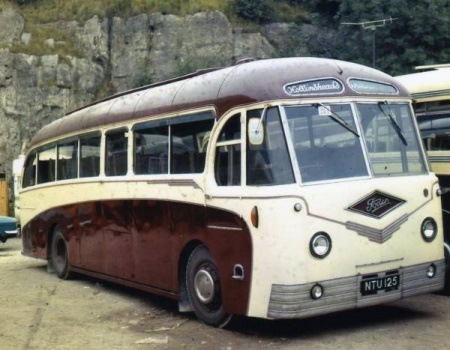 Merthyr bought six double-deckers with unfortunate-looking Welsh Metal Industries bodies. Do you think the WMI body is a poor copy of Weymann’s? [Especially the external roof ribs.] Apart from Weymann and Roe, there were some really stylish bodies in the late 40′ and early ’50s – and then there were some real dogs! Try www.alangeorge.co.uk/buses.htm for a comprehensive gallery of Merthyr buses. Daimler, Leyland, Bristol and I’m not so sure….. includes these WNI Fodens with their (seemingly) shallow windows, and some newspaper cuttings including the hero driver who saved his passengers on the ice (bet you couldn’t do that in today’s straight-line specials). 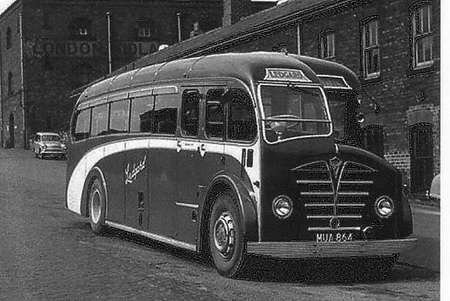 Here’s a Foden of West Mon: http://tinyurl.com/nf2ajo7 and here is a Welsh Metal Industries advert of 1948, showing a Merthyr bus. Note the great play being made of their light alloy bodies, primarily sourced from aluminium used from broken up wartime aircraft. Smiths of Barrhead seemed to favour Fodens. In addition to CGA 235 they had WMI bodied GGD 306 and Massey bodied JYS 466 which, though lowbridge like the WMI bodies, showed a much more sympathetic understanding of the Foden concealed radiator design albeit marred slightly by Massey’s then usual steeply raked top deck profile (see Classic Bus No 112 front cover for an excellent photo). Plaxton, Metalcraft and Whitson seemed to get it right with the coaches and East Lancs (above) probably the best decker. The Willowbrook that Tracky had from Cawthorne (ex demonstrator) was a bit of a dog, as well. Checking back, it’s not that different from the WMI design. Was this a Foden design used by both concerns? 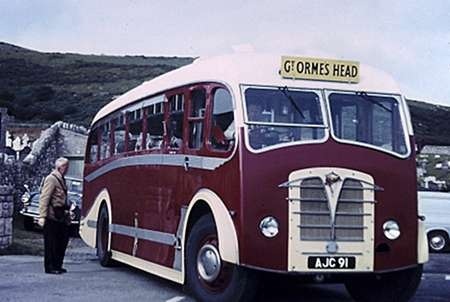 Welsh Metal Industries was one of the regional subsidiaries of the Metal Industries Group which also owned Sentinel at this time, and the bodywork was constructed from "stock" MI Group components used by customers such as J C Beadle. 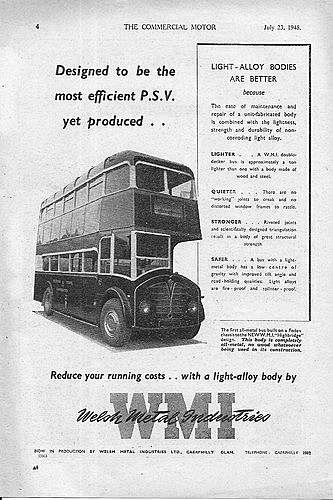 If you compare the downstairs windows of the PVD6 in the WMI ad to any shot of a Sentinel-bodied single-decker you will immediately spot the uncanny resemblance. Whitson also used these components (panels and window-pans) on the three SLC6/30 saloons it bodied to Sentinel’s basic design, even though these were timber-framed. 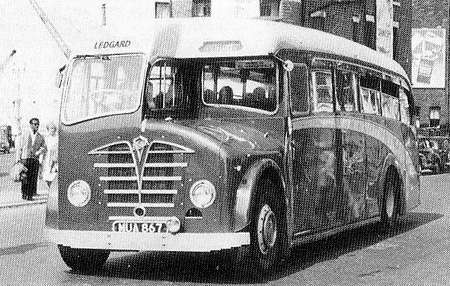 The same basic parts had originally been supplied to JC Beadle in the late 1940s for the various semi-integral saloons they built using Bedford, Leyland Cub, and Morris running units. That Foden is still in the open at Onibury today, together with a sd Foden and at least one other vehicle. All in the open and unprotected. Gosh Tony, not often we hear of Onibury (Shropshire) but at Stokesay Court there, which was a military hospital in WW1, my Dad recovered from wounds suffered on the Somme. The mansion has recently appeared in the film "Atonement." What a shame that the Fodens appear to be vulnerable like this. 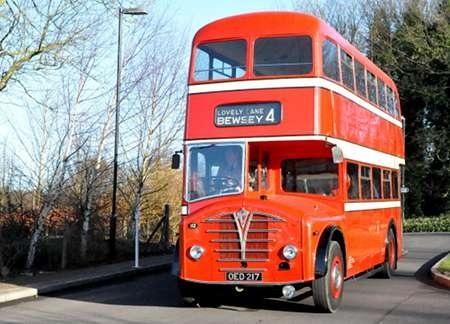 Sad if a superb, and superbly restored, bus ends up in PSV heaven for the want of a good, and solvent carer. Similarly, as Roger has intimated many times before, there are hoards of RTs and RMs in preservation but very few Fodens. For that reason alone it ought to be saved let alone the other fact, as I have said before, that Fodens were unassailably quality vehicles in their own right. This vehicle has been for sale at a totally unrealistic price for several years now. It breaks my heart to see it under threat because the owner (apparently) has the idea that he should recover some of the money he has spent on it in the past. We all know that Bedford OBs fetch fancy prices, but they’re easy to maintain and store (as well as being too cute for words!). Compare the price for the Foden with other similar vehicles in the small ads of B&CP – you could get three fully restored ‘deckers for this amount. Incidentally, does anyone know the current status of the other (Crossley bodied) Warrington Foden which went into preservation? Prices are irrelevant – it’s what people will will pay is the important point. 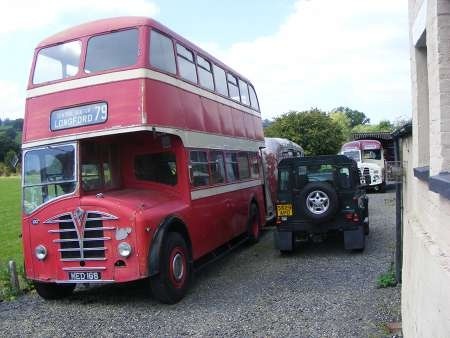 Crosville Motors of WSM have a Lodekka and FLF for sale at £22,500 each. Both in full working order and also can be viewed on Ebay. Of course these are Bristols so obviously more desirable!!! I notice some people mentioning about the WBT bus that’s at Onibury on here. I live in Ludlow (we actually moved from Warrington to Ludlow) and it was my dad that actually noticed the WBT buses parked up there. I’ve got a bit of a fear of level crossings (siderodromaphobia) so don’t tend to like crossing there, but I do know if you go from Ludlow end just after the level crossing there is a turning right into Onibury. The A49 is certainly not a place you want to stop to take pictures but if you turn in there, there is plenty of space on Back Lane to park and then walk back round to the level crossing. I’m quite sure I’ve spotted at least 2 Warrington Borough Transport buses there. I think one of them even has the destination of Wilderspool Causeway on it. Don’t know who owns them or anything about the people living there, but there does seem to be a lot of people living Ludlow who actually moved from Warrington, including Pete Postlethwaite used to live here. The attached picture of MED 168 was taken in September 2014 – from on the level crossing mentioned by Darren. As can be seen, there were some other vehicles on site – the white Foden coach being KMA 553, but registrations of the others could not be seen from the road. The Foden PSVs were high quality fascinating vehicles. I’m interested in the present location of these two, as when my Dad returned injured from the horrors of The Somme in 1917 he was convalescent at Stokesay Court, Onibury – a mansion which had been given over to military hospital use. I visited the house a few years ago when there were financial difficulties, as with many such gems, but its use in the making of the film "Atonement" has apparently improved its fortunes which is pleasing to hear. Sorry to digress, but for warrington buses to end up there is quite a journey. The above two shots of a Foden PVR with Fodens own two-stroke engine were taken in my ‘Transglobe’ driving days. I had taken it to the Foden works at Sandbach Cheshire for an annoying fuel pump fault – as I remember, apart from being noisy animals, these were very temperamental – constant adjustments to fuel delivery points (pump and injectors) being the order of the day. Although I never did a continental trip with this coach, I had one continental trip with a Bedford SBG Seagull that gave me quite a hard time ending with its brakes finally burning out on a very steep section in the Austrian Alps. The Church party and myself being returned to the French coast by a superior German coach, a ‘Satra’, as I recall. My thanks to Mike Beamish/www.mikesbuspages.co uk for allowing me to use a couple of his photos so that you can see offside views of a similar Metalcraft Foden PVR to the above. According to Mike NTU 125 had been repainted in deeper Cream with a brighter Red relief than the first time he took a shot of it. The last of these two shots shows it at the Buses 60 Rally at Wroughton when it was being used to transport visitors to the various hangars and exhibition areas. Perhaps returned to the coast by a Kassborer-SETRA – now just Setra: and still very good. Rear engine…. quiet, comfortable: why isn’t it Foden? Why isn’t it Foden? Setra have spent the last 50 years developing into the leading coach builder of Europe – if not the world. Foden chose to abandon PSVs and concentrate on HGVs – especially specialist applications. Given a different history, who knows? Foden quality was never in doubt. Foden and AEC could both have become as well regarded today as Setra – they simply didn’t survive (for historical reasons that most of us already know). Nigel Edwards’ recollections of driving this coach to Fodens for adjustments are fascinating. Transglobe operated the coach between February 1958 and September 1959, if my records are correct. I can confirm that it definitely had a Metalcraft body. The Foden two-stoke engine was, I believe, fairly complex – and probably misunderstood. Some companies seemed to like them, others just did not get on with them. 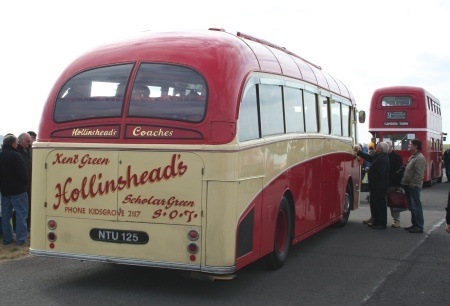 Cook’s Coaches from Lyneham in Wiltshire at one point had three two-stroke engined Fodens ….. in their fleet of three! The Whenuapai Bus Company and City Bus Services in New Zealand, however, had no end of troubles with their quintet, but once Hawkes’ Bay Bus Company bought up the bankrupt City B S along with the Fodens and had them properly overhauled, they found that the engine fan had been repositioned to accommodate the bodywork. Once the fans were correctly positioned, and also once they had a Foden-trained mechanic looking after them, they went on to give many years of reliable service. 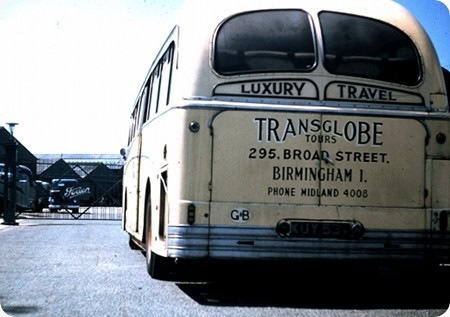 The last one wasn’t taken out of service until June 1980, later than some Leyland Royal Tigers in the same fleet. All five went on to serve as movans (mobile homes) and two still exist in such a capacity even now, though one is effectively immobile. 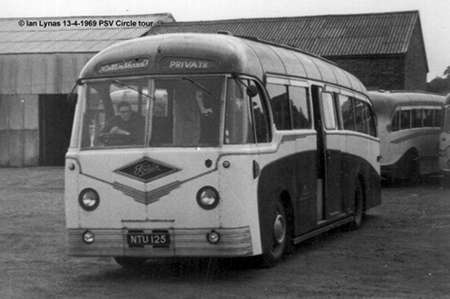 I (and probably 50 or so other enthusiasts) took this shot of NTU 125, a rear-engined Foden with Metalcraft coachwork belonging to Hollinsheads of Scholar Green in Cheshire during a PSV Circle Manchester tour on 13th April 1969. Fantastic tour which brought out Fodens from every nook and cranny. I think the tour was organised by the late Peter Roberts. As far as I know Peter Roberts is still with us! Hardly any bus enthusiasts in the Manchester area doesn’t know of him, remembering with affection the PSV Circle meetings which still continue today, but I particularly remember the halcyon days of the late ‘sixties/early seventies (when Ian was there too!). They were in the Briton’s Protection hotel overlooking Lower Mosley Street and always very popular. Can anybody lend me some photographs from this visit to Hollinshead’s (or scan them for me at 300 dpi or better)? I’m currently working on a book about Northwest independents and prints of their (pre 1970) vehicles have proven surprisingly hard to find. Weirdly, I’ve never knowingly met Peter Roberts although for several years I lived on Dane Road in Sale – virtually around the corner! I am of course familiar with his reputation as an outstanding photographer. Help? My apologies to Peter Roberts. Good to hear he is still around and if you keep contact with him, thank him for the meetings which had a good smattering of everything, an ability to talk to like-minded enthusiasts, a quick formal part, great slide presentation and lots of info about what was going on in the local bus world. Thanks also David, I might have to reward you with a picture of your good self and others with Southport Crossley 116.
to Neville Mercer, I only took one other shot at Hollinsheads of a fairly new Duple Dominant, GTU 119G. It is already scanned at 300 dpi at 3008 x 2000. Any good Neville. The Dominant is a bit new for my tastes, Ian, and would have been delivered after Hollinshead’s stage service ended. I would like a scan of your shot of NTU 125 though – I already have several, but all taken after it entered preservation. 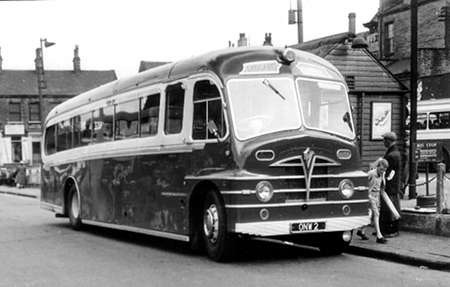 Anybody else got any photographs of Hollinshead’s half-cab Fodens or Bedford OWB bus? The Hollinshead Leopard referred to was actually a Duple Commander. It was reputedly bought outright off the Duple stand by family members visiting the 1968 Commercial Motor Show and was in effect a ‘new generation’ vehicle. Previous purchases for over 10 years had been Bedford SB (petrol and diesel)and latterly all second hand. The off white/tangerine band livery on GTU became the fleet standard. Although unconfirmed, at the time of its arrival some 18 months later usually reliable sources stated that second hand (and similarly liveried)OOP 173G had been the Bedford/Viceroy counterpart of GTU 119G at he 1968 show.